Vik Muniz takes well known images that have become familiar through repeated reproductions and recreates them from memory, using household materials like sugar, chocolate, and thread. He then makes a photographic record of them using a dye destruction method of printing his photographs. Muniz creates a witty and uncanny effect by translating these well-known images into strange visual puzzles. We can either suspend disbelief by imagining the 'original' photograph which inspired his invention, or think of his work as virtuoso drawings which last only seconds for the camera before melting or disintegrating. This is one of several of Hans Namuth's portraits that Muniz has recreated using chocolate syrup. The original photographs were published in Life magazine. Dye destruction prints are made using print material which has at least three emulsion layers, each one sensitised to a different primary colour--red, blue or green--and each one containing a dye related to that colour. During exposure to the negative, each layer records different information about the colour make-up of the image. During printing, the dyes are destroyed or preserved to form a full colour image in which the three emulsion layers are perceived as one. Dye destruction prints are characterised by vibrant colour. The process used to be called Cibachrome; it is now known as Ilfochrome. 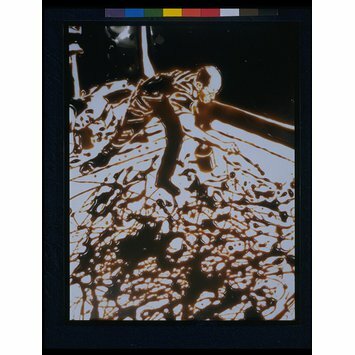 This large scale portrait of Jackson Pollock at work in his studio has been made in chocolate and then captured on photographic film. The chocolate has been shaped to resemble an original photograph taken by Hans Namuth. "Why do people like magic? The lower the technical approach of the magician, the better the trick appears to be. People like to be fooled, but they also like to have the impression that they're not being fooled ... If one makes a drawing that works on a photographic level, like photorealism, you tend to believe that thing as actually existing at one point, much as you believe a photograph ...There's something magical about the fact that I can take this pencil here, I can make ten little marks with it, and you can see a house. This is alchemy." Muniz recreates well-known images with materials such as sugar, chocolate, and thread. He then makes a photographic record of these ‘drawings’. 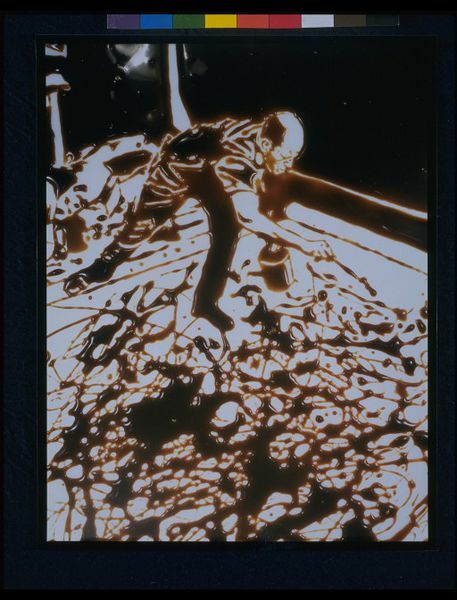 Here, he reproduces a famous photograph of the painter Jackson Pollock at work. 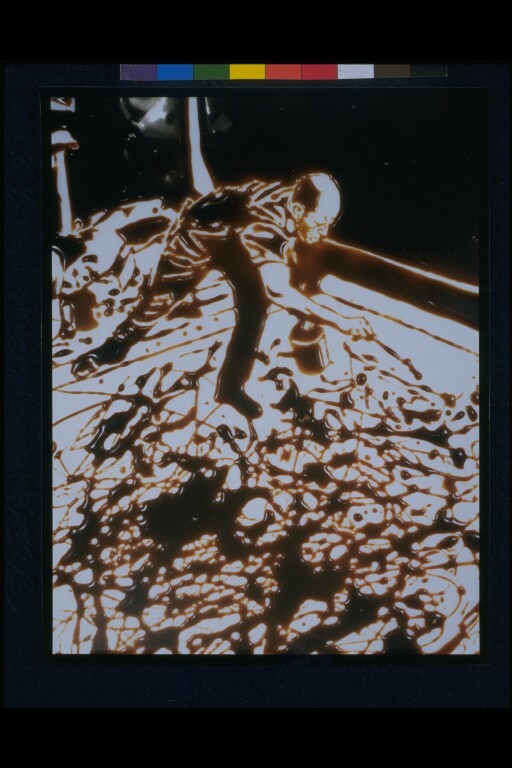 The sticky chocolate sauce echoes the characteristic drips of paint in Pollock’s work.